“Security is the denial of life. Love is what enables us to cross borders.” – Robin Reineke, founder of Colibri Center for Human Rights – whose work this collaborative #mural is based off of. Colibri Center for Human Rights does the fierce forensic and beautiful work of reuniting with families the remnants of the resilient migrants who die in their journey across the border. When the wheat paste bones peel off, it will reveal a human carrying her child driven by an undefeatable love that drives her to transcend borders. Here I’m wheatpasting the last wing bone for Chip Thomas who sized and put together the whole skeleton and whom I learned to #wheatpaste from. 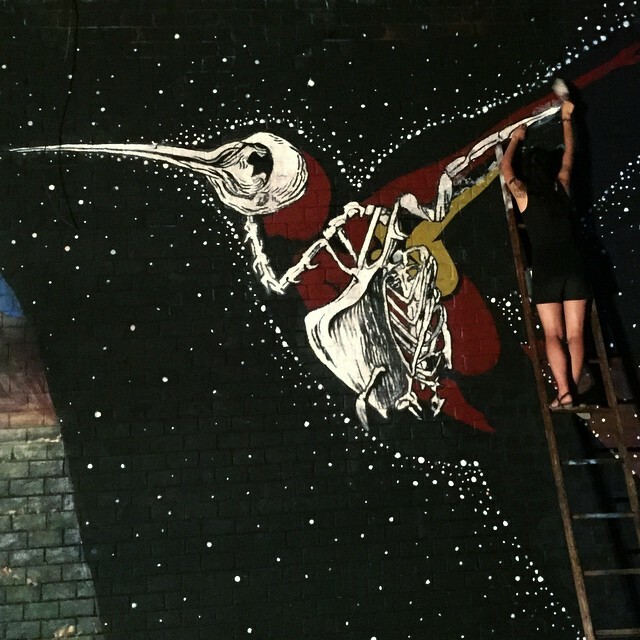 This mural could not have been possible without the love and creativity from the local Phoenix arts community who wanted to bring the illumination of migrants to the forefront and honor the dead. This is only 1/5 of a massive Mural collaboration with artists including Karlito Miller Espinosa Thea Gahr, @theallelectrickitchen, Julius Badoni, Lucinda Yrene and Lalo Cota and so many more people. The full reveal will be tomorrow. thank you Phoenix, you have been brighter than I could’ve ever imagined.